If you’ve ever participated in a live auction, you know there’s some strategy involved in order to win the item you want. But what about online auctions? In our new GoFigure! 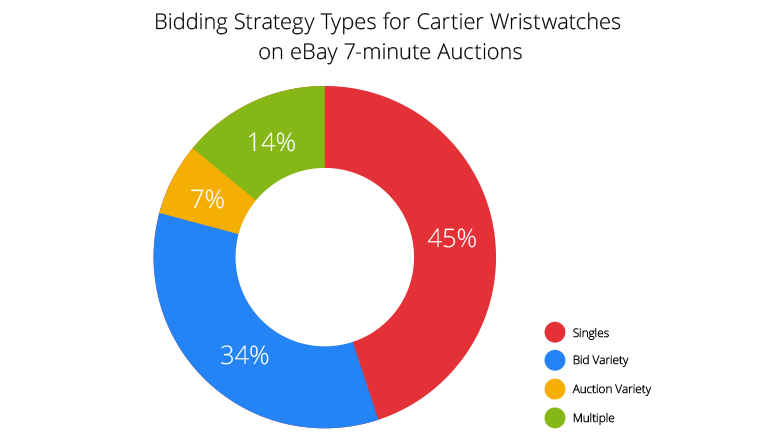 analysis we take a look at data about all the action in the seven-minute eBay auctions. The dataset we found on Kaggle includes data about unique auction number, the list of bidders, every bid that was given for the whole length of the auction, open bid price, and winning bid price. This piqued our interest because we figured that, from this data, we could learn a great deal about how to strategize to win the seven-minute auction. “Singles” – This is the most popular bidding behavior with 43% of the bidders participating in one auction with one bid. “Bid Variety” – 33% of the bidders participated in one auction with two or more bids. 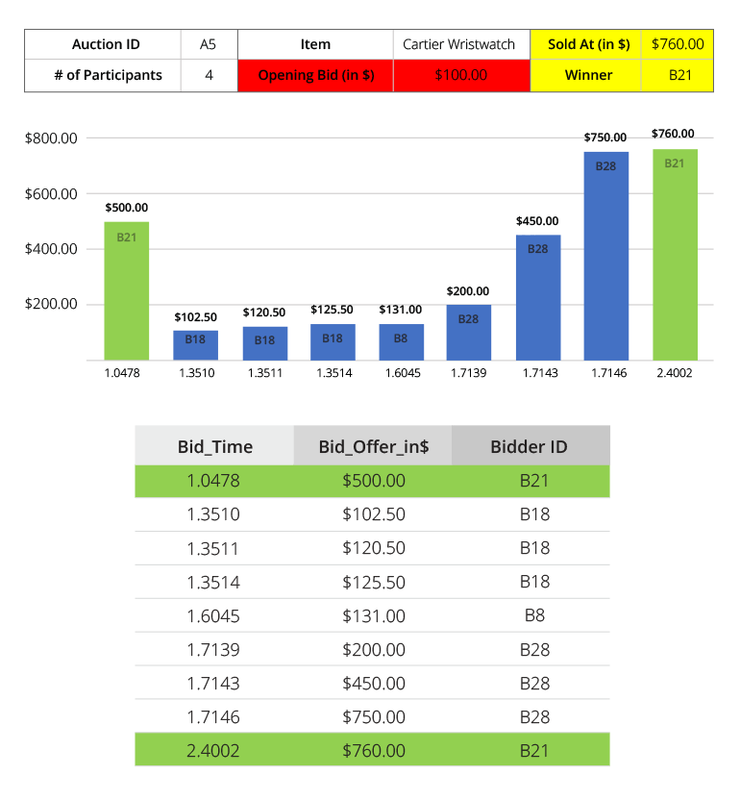 “Auction Variety” – 7% of the bidders participated in two or more auctions, with one bid for each auction. “Multiple” – 17% of the bidders participated in at least two auctions with two or more bids in each of the auctions. Since the auctions have a very strict time limit and take place for seven minutes only, time is of the essence. Every second counts. 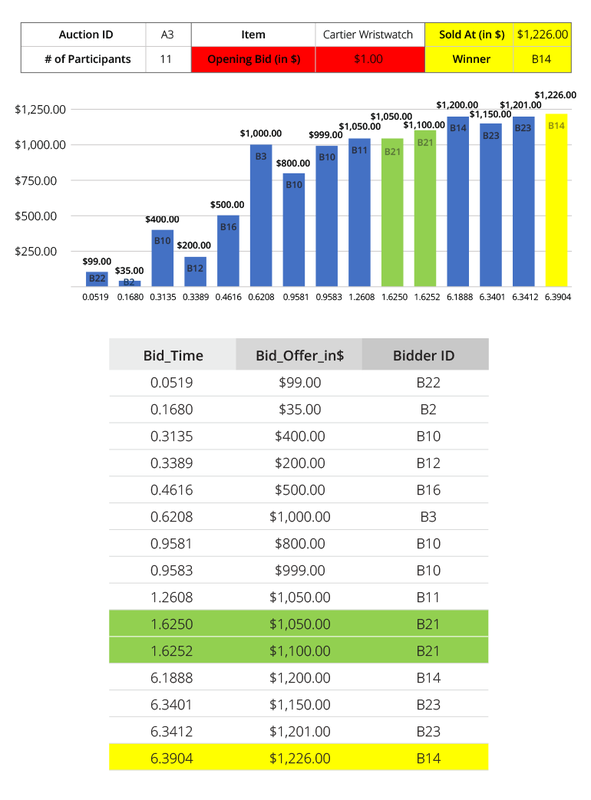 The data shows that 19% of the winning bids are placed at the last 15 seconds of the auction. Specifically for the Cartier wristwatches, we found that bidders are willing to up their price dramatically in the last 15 seconds of the auction with 24% of the winning bids being placed then – an even higher amount than the overall auctions stats. How is the bidding price determined? There are many factors that affect the bidding price. These can include an open bid price given by the seller, a market price the bidder is aware of, results of other auctions the bidder participated in, and most importantly, the dynamics of the specific auction the bidder is participating. Specifically for Cartier watches in our dataset, we found a large range of winning prices. The minimum win price was $26 and the maximum win price was $5,400! The average win price was $876. How can you win a Cartier Watch? To understand the drama of buying things in an auction setting let’s demonstrate a day of bidding for one participant that desperately wanted to purchase a Cartier watch: Mr. or Ms. B21. 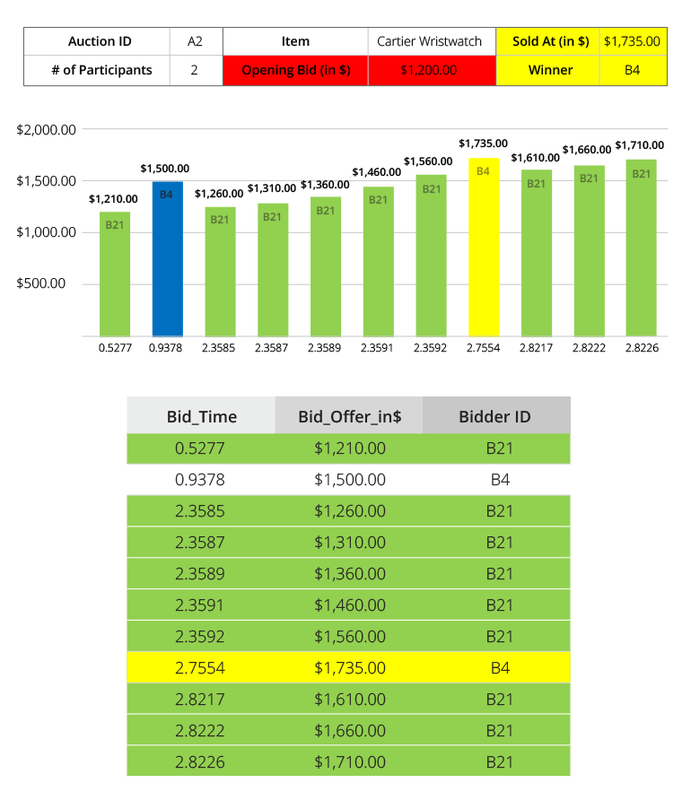 The data shows that B21 had a 21% chance to win in any given auction he or she participated in. But did they ever win a watch? How much did the end up paying? 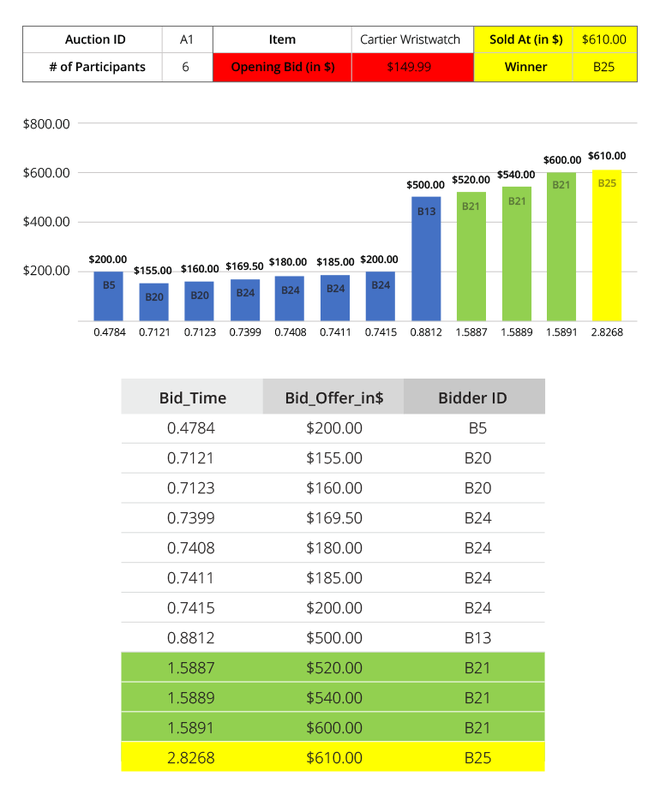 Let’s follow their bidding behavior to see the strategy behind the price given, timing, and the number of auctions they participated in. The first auction B21 participated in was A1. The auction had six participants, opening bid was $149.99, and the watch was sold for $610.00 (407% over the opening bid price). The winner was B25 who took the watch from B21 for a mere $10 more. Below you can see the detailed bids of auction A1. B21’s bids are highlighted in green and the winning bid is yellow. B21 joined the bidding with a $520 bid, then $540, and $600. However, B25 bid $610 and won the watch with only one bid! This auction had only two participants. The opening bid was $1,200 and the watch was sold for $1,735 (145% over the opening bid price). The winner was B4 who took the watch from B21 for a mere $25 more. Below are the detailed bids. B21 bids are highlighted in green and the winning bid is yellow. Our friend B21 placed 9 out of the 11 bids in this auction and still came up empty-handed. This auction had 11 participants. The opening bid was $1.00 and the watch was sold for $1,226! The winner was B14 who took the watch from B21 for $126 more. Below are the detailed bids. B21 bids are highlighted in green and the winning bid is yellow. In auction three, B21 participated with only two bids. B14 came in at the last few seconds of the auction and put their bid in with $25 over the bid price and won. This auction had nine participants. The opening bid was $1.00 and the watch was sold for $1,525! The winner was B6 who took the watch from B21 for $525 more. Below are the detailed bids. B21 bids are highlighted in green and the winning bid is yellow. This auction was very active with 41 bids placed in the seven-minute time frame. B21 came in at the first minute of the auction, placed a bid of $1,000, and believed the watch was his (or hers). However, towards the end of the auction things got busy and B7, B9, and B23 started to bring up their bids significantly. Finally, B6 came in and took the watch with $25 more than B9 who was at $1,500…Ouch. Does B21 ever win a watch? Well, here is the good news: auction five brings a happy ending to this saga. This auction had four participants. The opening bid was $100 and the watch was sold for $760 (760% over the opening price)! The winner was our friend B21 who took the watch from B28 for $10 more! Below are the detailed bids. B21 bids are highlighted in green and because B21 won this time around, there’s no yellow. What was the bidding strategy used by B21? Well, it is pretty obvious. The “singles” approach (one bid, one auction) was used in auction one didn’t win a watch. The “bid variety” strategy was used in auction two didn’t win the watch. The “auction variety” approach was used in auction three and didn’t win the watch. However, after B21 participated in several auctions (A1-A4) and put in more than one bid, specifically towards the end of the auction, they got the watch. BOOM! Good going B21. To learn more about acution bidding strategies read the full GoFigure! report and analyze the data for yourself in our interactive dashboard.